Like many of Alaska's Native languages, Dena'ina is severely endangered. Official and unofficial policies of the United States government, like the forced removal of children to residential schools, have contributed to the decline of spoken Dena'ina. Today only a small number of active speakers remain, and children no longer grow up speaking Dena'ina, but several projects are underway to help reverse the trend and bring spoken Dena'ina back into daily life. One such project is being conducted by Lake Clark National Park. As part of its survey of the western Cook Inlet region, the Park is working to create a comprehensive catalog of all known Dena'ina audio recordings. The recordings are found in various locations, from the Alaska Native Language Center in Fairbanks to the Bureau of Indian Affairs ANCSA Office and personal collections. Dr. James Kari has inventoried over 350 recordings so far. Another venture is Project Jukebox, a joint effort between the UAF Rasmussen library and Lake Clark National Park. The project has compiled interviews with elders, photos and maps into an interactive CD-ROM. 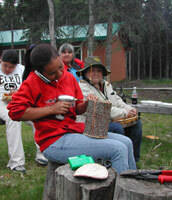 The Project Jukebox website is found at http://uaf-db.uaf.edu/Jukebox/lakeclark/home.html.